Springs are available in a large variety of shapes and sizes. Almost everyone will have either used a springboard at a swimming pool to dive into the water. The springboard may be made from laminated wood (layers of wood glued together) or be a more modern glass fibre type material. The result is the same - the diver uses his/her weight to spring off the board into the air. Springs have a very wide range of uses and it is difficult think of a mechanical device without one or more of them. Springs perform different actions and some examples are seen below. Some restrict stretching whilst others restrict compression. Springs are used in engines, motors, watches, clocks, door handles, locks, pens etc... Choose a simple mechanism and dismantle it. Study how any springs work and draw a diagram to represent the movement involved (add explanatory notes). 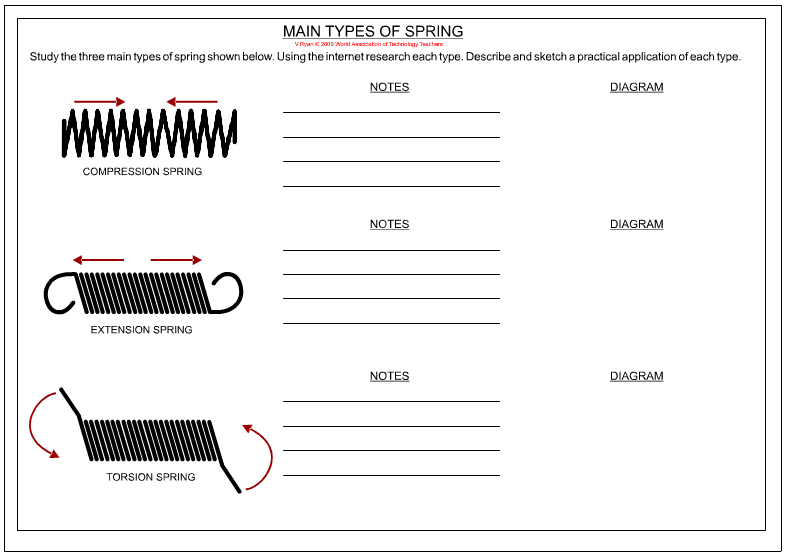 List three materials that possess the property of ‘spring’ and describe a practical application (example - a plastic ruler manufactured from polyethylene). Study the three main types of spring shown below. Using the internet research each type. Describe and sketch a practical application of each type.